I'll be visiting AMT soon to see their range of products and services, until then, here's their latest information pack. They also have some testimonials (page 1 and page 2) from people that have used their kits. Scroll down or click here to see pictures of an AMT frame as fitted to a car displayed at the 40th Anniversary at Silverstone. The tubular frame is designed to take the Vauxhall 16 valve engine and F20 5-speed gearbox. 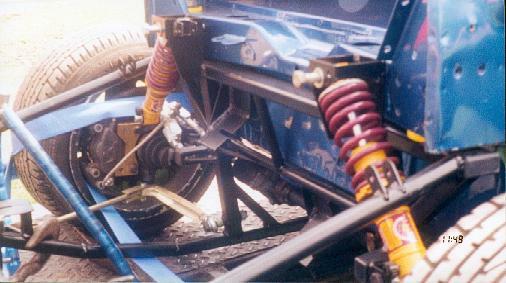 Part of the frame was designed by computer (CAD) and with the aid of a stress engineer from British Aerospace. It is designed to take the original tower bolt fitting with the addition of brace bars. The frame itself is built in a jig when being assembled to ensure accuracy. It is also fully triangulated to withstand loads developed from the Vauxhall's high BHP and torque figures produced and therefore is not a sub-frame that has been cut and parts added. 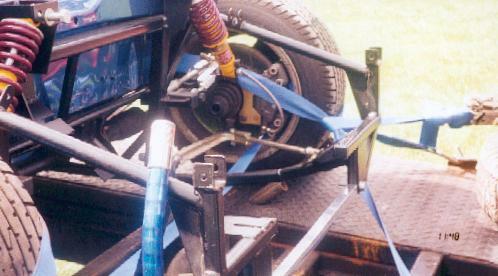 The suspension design of the frame consists of two top rose jointed arms per side and allows the fitment of coil-over shock absorbers which carry the Vauxhall engine better, this then retains the standard hub and allows the normal bottom Mini rose jointed arms and tie bars to be fitted. The engine mounts have been produced for the frame so that each one incorporates a set angle which in turn minimises engine rock under hard acceleration. To ensure the installation of the frame and engine, if fitting in the Clubman shape, part of the inner wings need to be modified. Apart from this the installation should be straight-forward. However, if you wish to retain the round nose end look, it is advisable that you use the ABS front end as this was specially designed for our frame. 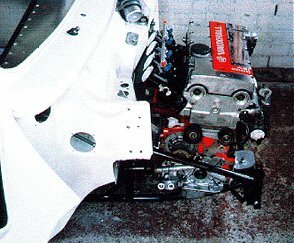 Bulk head modifications may also be required to allow access for the carburettors depending on the inlet manifold used. 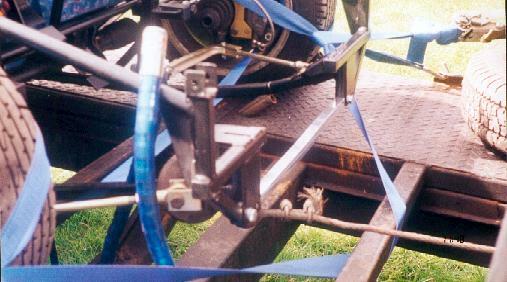 The above tubular frame differs from the standard version by allowing 2.25" coil over shock absorbers to be fitted inboard which in turn allows the shock absorbers to run tangentially to the top arm, which cannot be achieved when using them at a 90 degree position. 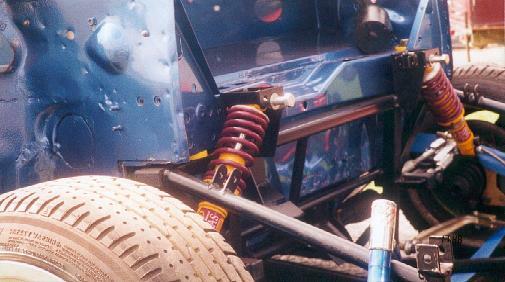 This in turn allows greater suspension control and the car to run lower. The frame has been modified to take the 2.25" coil over shock absorbers by incorporating the top suspension mounting points onto the frame. 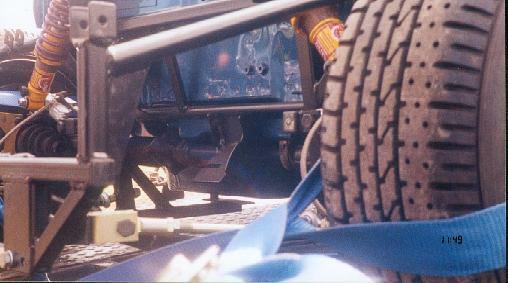 The mountings are coupled by an aluminium rose-jointed strut brace to eliminate flexing. Additional connections back to the frame are also made by aluminium rose-jointed bars. 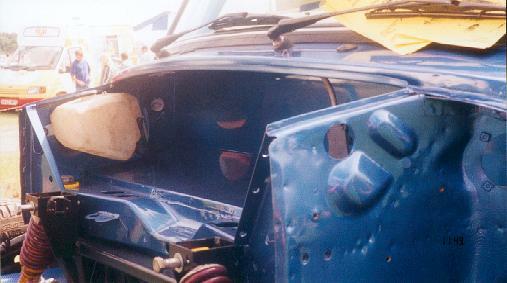 As for the standard assembly with two additional holes per side required in the front cross member. This frame is designed for competition and occasional road use. The advantages of fitting a 16V Vauxhall engine to the Mini allows you to own the ultimate front wheel drive car and offers you the opportunity to use the latest multi-valve engine technology i.e. full engine management, traction control etc. The prospects of owning a car of this calibre can be seen with the current two-wheel drive 2 litre rally cars i.e. Peugeot Maxi and Renault Megane which are running stage times quicker than the current top four-wheel drive rally cars with the assistance of traction control. AMT has the facilities for building the engines and has been involved in building multi-valve cylinder engines for approximately 10 years, starting from motorcycles to the current Vauxhall multi-valve engines. Starting with replacing the factory intake system and adding a pair of side-draught carburettors on a purpose-made manifold. Depending on the type of ignition system used and the size of the chokes, 170-180 BHP should be available. To take Stage 1 a step further, throttle bodies are added to the intake system which gives better drivability and greater BHP from the engine. This requires an engine management system to control the fuelling and also the ignition which allows you to retain the standard distributor or distributor-less system. It is advisable that up-rated con-rod bolts are fitted to ensure reliability of the bottom end. Adds a pair of cams to the above and should give 190 BHP + if added to stage 1. Whilst the engine is dismantled, a flowbench developed cylinder head is added to give even greater BHP and with the aid of the flowbench, we can design the head to suit your requirements. 220-230 BHP should be available. Incorporates high compression forged pistons and allows a higher lift cam to be used. 250-260 BHP should be available. We can also supply and fit the ultimate AMT turbo kit which incorporates a purpose made exhaust manifold, designed with the aid of a flowbench, to fit a Garett T3 turbocharger. 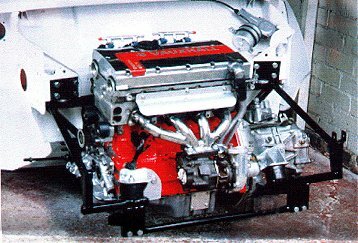 This installation uses throttle bodies mated to a purpose-made plenum chamber with a DTA engine management system. Over 300 BHP is available depending on specification. AMT can now add Racelogic traction control systems to all the above and can highly recommend it for getting perfect traction in a high-BHP front wheel drive car. Clubman Specification - As for road spec. but with launch facilities for quick throttle starts. Professional Kit - The ultimate specification with many advanced features including full throttle gear change and in-car adjustable slip. AMT has seen 0-60 times of 5 seconds and under, even faster times are available with traction control. The system will also reduce under-steer and torque steer and allows the driver to accelerate more smoothly without uncontrolled wheel-spin. The following pictures are from a car displayed at the Mini's 40th Anniversary at Silverstone. 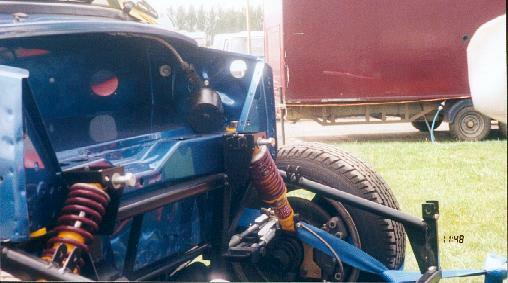 The AMT subframe is the race version and has the 45 degree angled shocks to allow lowering. Thanks to Richard (AKA Muppet) for the great pictures! Just click on them to enlarge.